The easy way for Montessori Educators to spend more time doing what they love – guiding young minds! Let’s face it, the school day just never seems long enough. You enjoy the time you spend with your students but all of that other administrative stuff. . . ‘eh, not so much. Never fear, Montessori Compass is here to help! MC was designed by Montessori educators to help simplify record keeping and other time-consuming classroom management tasks. MC’s powerful, yet easy-to-use online tools save you time, freeing you up to do more of what you love to do – guiding young minds! The Montessori Record Keeping solution that adapts to your work flow! Put the clipboards away and record your daily classroom activity from ANY web-enabled device! MC’s incredibly easy-to-use record keeping interface works beautifully on an up-to-date iPad, iPhone, Android tablet/phone, Mac, or PC. Plan your lessons in advance or record independent lessons in real-time. This is the perfect solution for any Montessori Educator seeking a record keeping solution that just works! 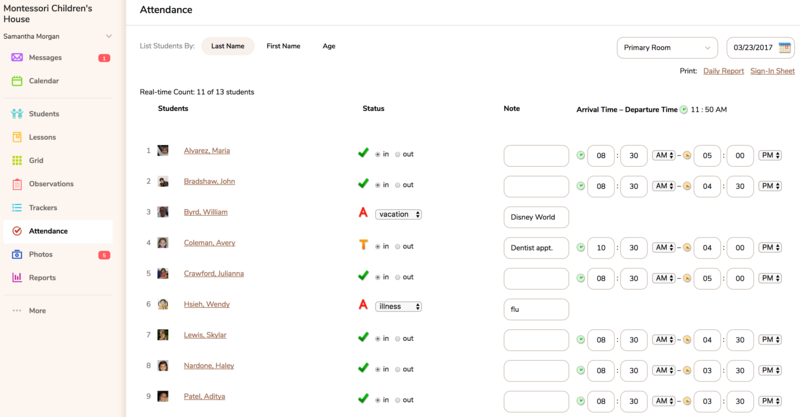 All record keeping data is automatically saved and tagged to designated student profiles. Real-time reports on classroom progress can be generated instantly. 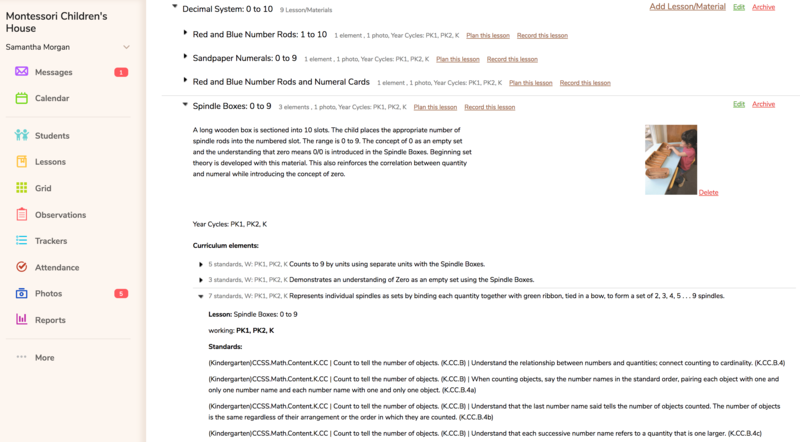 Use our Montessori Scope and Sequence or add your own. Montessori Educators from all over the globe agree… this is the Online Montessori Record Keeping system you have been searching for! Start your day off with a cup of coffee and your easiest task of the day! Student list automatically populates with correct names, based on day of the week. Mark all students present with a single click. Absence reasons are customizable, making accurate reporting a breeze. Just check off absent or tardy students, watch your data get auto-saved, and enjoy your coffee! Like having a fresh sheet of paper in a student’s individual notebook each day! A Montessori Educator’s classroom observations are vital for successful charting of individual learning paths. 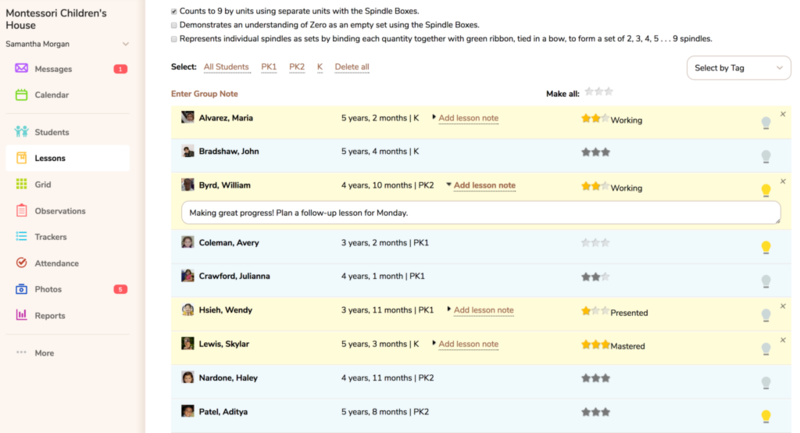 MC’s Classroom Observations feature makes it easy to record private notes at any time for your classroom and students. Observations are automatically saved in real-time and shared with other staff members (great for team-teaching). Record a quick one-liner or multiple paragraphs. Jot down additional notes throughout the day, edit existing notes, and access historical notes at any time! Illuminate your independent work plans! Charting an independent work plan for each child in your classroom can be challenging. Lesson ideas help make this process easier than ever, by providing a flexible tool that enables you to plan lessons for the future – without committing to a specific date. 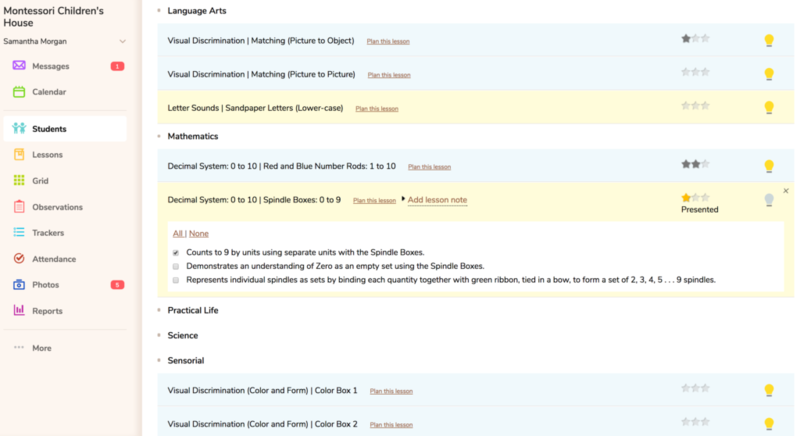 Each child has their own to-do list of lessons, which are accessible on the Lessons page. Light bulb icons can be found throughout the system. Simply click the icon to add a new lesson idea for one student, while recording or planning the same lesson for a different student. When the lesson has been recorded, it is removed from the child’s lesson ideas list. Record many records for many students at the same time! Batch Record Keeping makes it easy to do a high volume of record keeping in a short period of time. If you are starting a new Montessori Compass account mid-year, this is the perfect tool to back-date all of your records since the beginning of the school year. If you record student activity on paper during the day, this tool makes it simple to enter your records at the end of the school day or at home on the weekend. Just choose an area of the classroom, select your students, and check the lessons you wish to record. Now your lessons are easy to plan and easy to share! 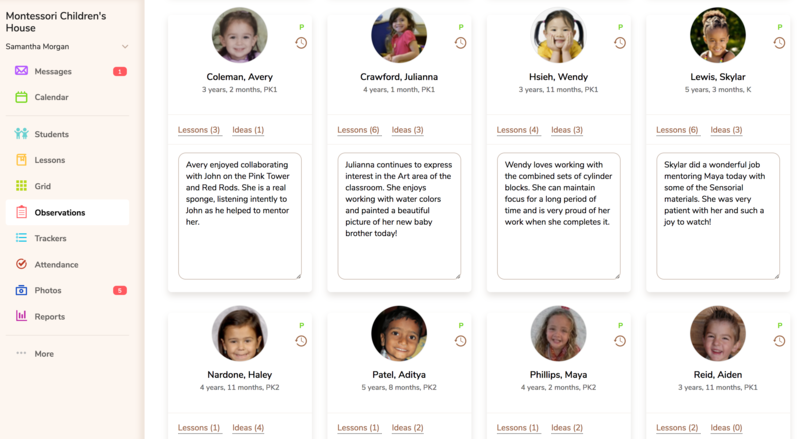 Montessori Compass makes it easy to share lessons with colleagues and reuse in your classroom for years to come! 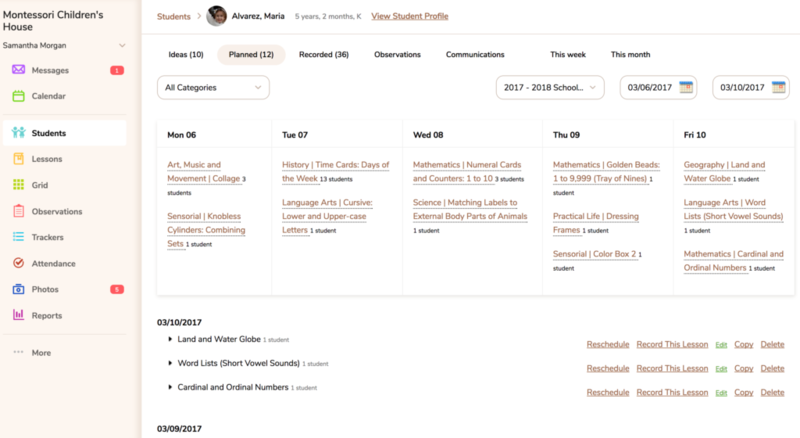 Lesson names & descriptions can optionally publish directly to parent calendars to help parents continue education at home. 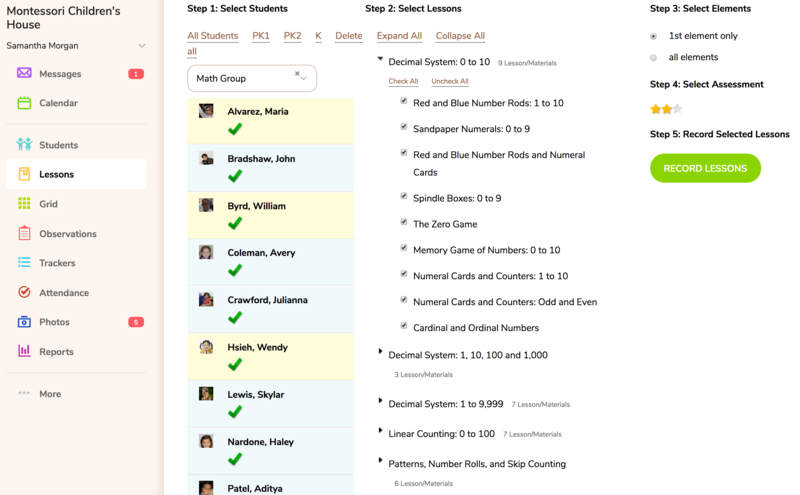 Assign lessons by classroom, year cycle, custom student groups, or on an individual basis. Lessons are automatically tagged to designated students, making progress report time a breeze. Plan classroom activities and lessons in advance – days, weeks, even months ahead. Plan for a specific date, but record when the child is ready. Keep your classroom on track and focused on making the most out of every learning opportunity! Customized Work Plans for every child in your classroom! Work plans are automatically generated and include all planned lessons for the week. You can view on the web, download a PDF, or print. Work plans may include all students in the classroom or can be filtered by an individual child. Get a birds-eye view of how each child is progressing in your classroom! The Classroom Progress At-A-Glance Report is a terrific example of the power of online record keeping. Choose any area of the classroom, then proceed to drill down by sub-category, lesson, and element (measurable learning objective). This provides a real-time account of how each child is progressing through the Scope and Sequence. Download a spreadsheet to analyze the data in greater detail. 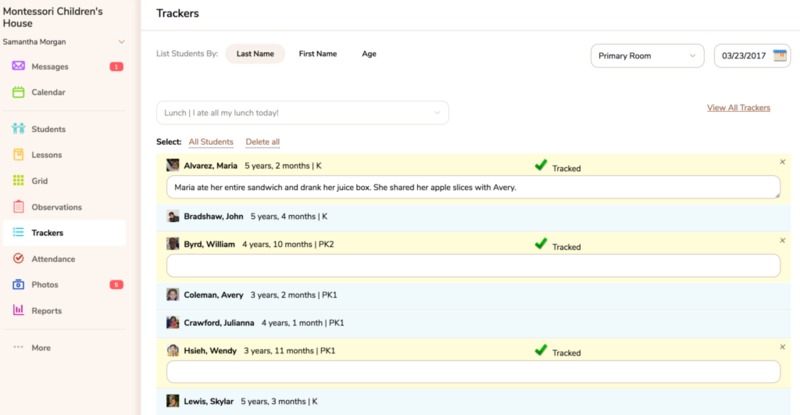 Naps, Meals, Toilet-training…create customizable trackers for any classroom situation! Trackers are a flexible tool that enable you to create a customized list of things you need to keep track of throughout the school day. Replace paper forms you currently utilize for daily things like naps, meals, or toilet-training. Trackers can be automatically shared with parents via optional daily/weekly Activity Reports or can be kept private. Powerful reporting tools enable you to instantly see which students have turned in the field trip permission slip or how many students still need to complete a special classroom project. Simple & Convenient…Sharing updates with parents has never been easier! 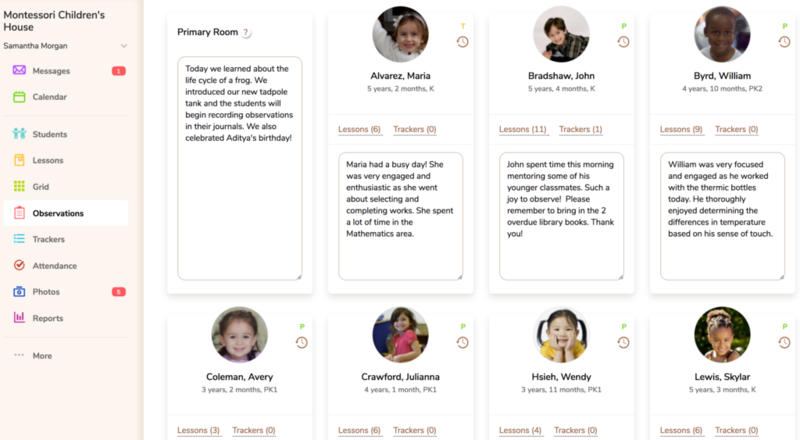 Similar to the Classroom Observations feature, the Parent Communication feature makes it easy to share information with parents. Share a single classroom note that all parents can view or share private comments/reminders with individual parents. Comments will appear on the student’s Activity Report, which is an optional feature that can be made available to parents on either a daily/weekly basis.